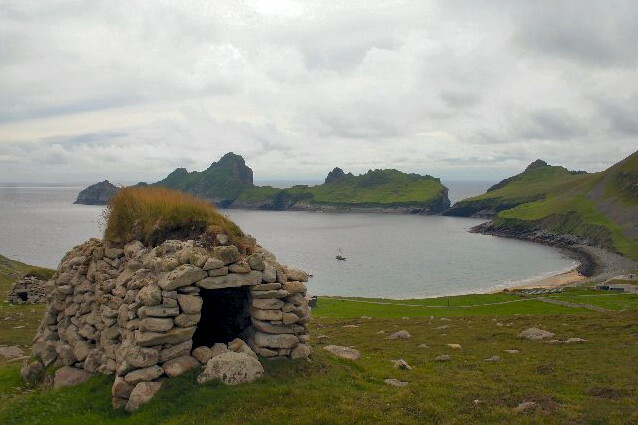 The archipelago of St Kilda is the remotest part of the British Isles, is made up of four main islands and sea stacs and lies 41 miles west of Benbecula in Scotland's Outer Hebrides. It is one of the best places in Britain for diving because of its clear water and its submerged caves, tunnels and arches. It has the highest seacliffs in Britain – 1400ft (427m) and the highest sea stacs. Its islands with their exceptional cliffs and sea stacs form the most important seabird breeding station in north-west Europe and is a National Nature Reserve. Today, these three organisations, The National Trust for Scotland, Scottish Natural Heritage and the MoD, who work in partnership to further a continuing programme of conservation and research on the islands and to ensure the care and protection of this World Heritage Site. Other facilities include: TA small museum at House 3 in the village, and a shop and a WC in the village. A self-guiding walk leaflet around the village is also available. What can you see and When is best to visit. Spring: Seabirds arrive back to nest, gannets and fulmars arrive first in February, guillemots, razorbills and kittiwakes in March, in April the puffins (roughly 270,000 birds visit) and great skuas. The Soay sheep lamb in April with a few early arrivals in March. April is also a good time to hear the St Kilda wren. May: Storm petrels arrive, at night you can hear them calling. A good month for watching for spotting whales. June: Razorbill and guillemot chicks, a good month for spotting whales. August: Puffins leave to spend the winter out at sea. Fulmar chicks visible on their nests. September: A good month to spot migrant birds passing through: geese, waders and passerines. October and November: Male Soay sheep rutting. Grey seals have pups. Getting there: Via boat only various trips are available from Mallaig, Oban and the Western Isles. A number of cruise ships also call. Access: via boat and tender. Access to old village is along an unpaved and uneven path. Paved road from slipway leads to top of hill and is steep in places. Notes: No Dogs allowed. WC in the village.